The first three articles of the “Lady Anglers Corner” in Coastal Breeze addressed the many benefits sport fishing provides, tackle selection and what conditions and structure to look for when seeking fish. Now it’s time to start fishing using the skills mentioned in previous articles to your benefit! This author suggests testing your skills with local mangrove or gray snapper fishing. Mangrove or gray snappers are quite common around mangrove edges, reefs, rocks, docks and other structures. This is one reason why starting with snapper fishing is a good idea as your likelihood of achieving initial success may be greater than when targeting red fish or snook. Whether you are a novice or an experienced angler, snapper fishing provides excitement, fun, challenge and, at times, non stop action, which makes it a great fish to target as a beginner as well as an experienced angler. It is true that catching small snappers can be fairly easy once you find them as they are less cautious and more impulsive than their older and larger counterparts who have been tagged as the most wary fish when it comes to a baited hook. Most mangrove snappers caught in the numerous back country areas of SW Florida are less than 14 inches in length. Let me assure you that a “keeper” mangrove snapper (10 inches or more) will impress you for both its game qualities as well as its value on the dinner table! you are best to use light fluorocarbon leaders and tackle with small hooks which provide the most natural presentation of the bait in the water. Live bait including baitfish or minnows and shrimp make the best baits when targeting snappers. When you become skilled enough to deceive the big ones, the battle waged by the snapper will surprise you. These sporty fish will often swim right toward you creating slack in the line and subsequently a lost fish. Additionally, they often swim sideways to maximize leverage or dive or sound toward the bottom or around structure. These hard-fighting members of the snapper family are pound-for-pound one of the fiercest fighting fish found, which makes them a great challenge on light tackle. Be sure to keep your line tight, and rod tip up when you hook a mangrove to avoid a lost fish Having plenty of bait available is a must when seeking the mangrove snapper as they are known to be avid bait stealers. As for food quality, the flesh of the mangrove snapper is firm, white and flaky and can be prepared just about any way for a delicious meal. Although you will need more than one gray to feed the family, the reward of a most delectable meal will be well worth it! 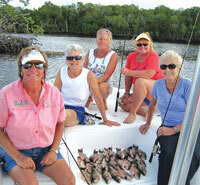 Captain Mary specializes in fishing the beautiful Ten Thousand Islands. She holds a “six pack” captains license and has a knack for finding fish. 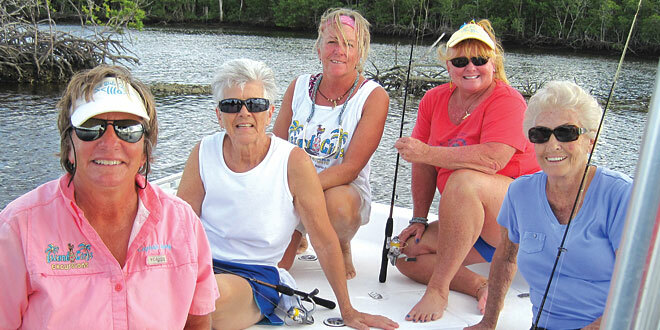 A passionate angler possessing over 35 years of extensive experience in both back country and offshore fishing, Mary offers fishing expeditions through her Island Girls Charters company. When fishing with Captain Mary, you will be exposed to a variety of successful techniques including cast and retrieve, drift fishing, bottom fishing and sight fishing. Visit www.islandgirlscharters.com to learn about fishing with Capt. Mary. Is Capt. Mary Fink still doing charters?